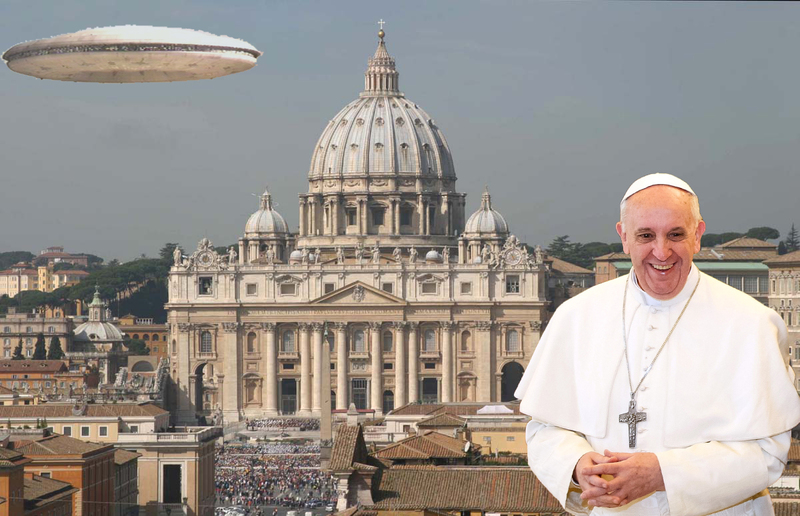 We already know about Pope Francis opening admitting he would baptize an alien entity, but now he has taken it one step further and rumors are abounding across the internet that the Vatican is about to disclose their preparations for Alien contact this June 2015. But is that just a rumor? Or is there some truth behind it? According to Daniel P. Sheehan—a Harvard College Government and Foreign Policy Scholar as well as the former U.S. chief councilmen for the Jesuit Order— says this very well might be the case. “Pope Francis wants to position the Catholic church and the jesuit order to be able to accept major shift in human consciousness a result of Alien existence as well as the evolution of a 6th faculty of human consciousness. The 6th faculty will constitute a new form of religion and contact between humans and advanced telepathic aliens. Who are the Aliens, UFO’s? The masses have been trained to call the Fallen Angels of Genesis chapter six, by another new name, “aliens.” These so called “aliens” have been involved with mankind since day one. They are not from another planet, rather they are inter-dimensional beings. Today they have infiltrated every branch of government and are calling the shots from behind closed doors; and although some deny their existence, their symbolism is very prevalent, and their name is very well known. No longer are the called the “fallen watcher angels”. But they hide under the TOP Ranks of the mysterious group known as the Illuminati! PreviousAncient Nephilim Underwater Metropolis Discovered Below Iceland? Or Something Else? You Decide! Shocking Imagery! Something So Sinister Has Arrived and It Is Now Impacting Every Christian Alive! We’re In Grave Danger! Lisa Haven Bombshell Report! This Abomination pope is Anti-Christian ( Antichrist )( 1 John 4:3 KJV )!! I think that this is the Reptilians and Project Blue Beams (a.k. false rapture). Also, think about Adam and Eve in the garden. Who talked to them? A devil in the form of a snake. A snake is a reptile. Aliens may very well be Reptilians. “Aliens” are demonic entities/fallen angels. the reptilian form is one form they take. But it isn’t everything. The Greys are more amphibian (the spirits like frogs). The Nordics are basically humanoid in appearance. Some look exactly like us, others have pointy features including ears like Elves or Vulcans from Star Trek. Some have less than 5 digits and some have more. (In the Bible some Nephilim had 6 digits). I witnessed an ‘alien’ in 2002 that was humanoid body with an elephant like head complete with a short trunk. The pilot of one of the alien ships in the movie Jupiter Ascending is very similar to what i witnessed standing in my hallway. the movie prometheous also depicts a trunk like helmet worn by the giant aliens. The being I encountered claimed to be of a scientist race of aliens. Going back to ancient times, the Hindu god Ganesh has an elephant head and human body. Hindu writings describe aircraft, spacecraft (Vimanas) and weaponry as advanced as what we have today. Bottom line is, all of this is being carried out by demons/fallen angels. What they really look like we may not know. We know gods angels are created only slightly higher than humans, and most often appear as human, though there are some extraordinary Cherubim and Seraphim mentioned in the Bible that are living creatures not at all human appearing. these beings are shapeshifters and seem to be able to take many forms. Elelel Le: This is intresting. The wive of a friend of mine before becoming a christian got in touch with demonic entities. I remember her saying this, almost 30 years ago: The beings I saw looked quite like E.T. Under which circumstances did you see this being? Spiritual attack? Regards, Peter, Salvation Army Officer. I been keeping up with all this stuff I too have been a witness to these things. Nephilims are behind the medical profession and the american dental profession. They love taking risks and don’t feel no shame if you are losing your health that they caused. That medical logo they use the snakes and rod think about it two serpents reptiles they love blood and pain no pain no gain. The bohemian owl a owl never sleeps its on the money all seeing eye and owl. So these are the main areas where they operate. Once they get your health in a sorry state its over from there.